We all know the “I want to believe” image with the UFO but now there is a better way. 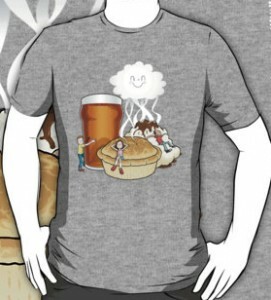 This t-shirt seems to show the famous UFO image but no the flying disc got replaced by a pie and below the image it says “I want to eat pie”. 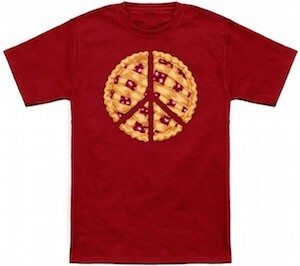 You can get this t-shirt in a bunch of colors so that you can have a different pie t-shirt for each day of the week. And this t-shirt comes in a men and women’s version in sizes Small – 6XL so if you are a small now then keep eating pie and the shirt can grow with you to a 6XL. 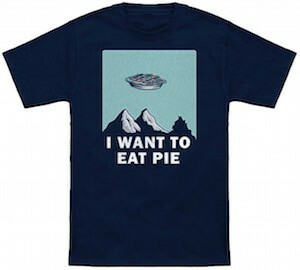 So if you want to believe in pie then you need to get this I Want To Eat Pie UFO T-Shirt. Mom’s home cooked meals, drinks and appetizers with friends and other great food smells that trigger memories. Why not remember these smells with this t-shirt with happy smells. On the front of the t-shirt is a pint of your favorite beer, mom’s hot apple pie, a mountain of fluffy mashed potatoes with a splash of gravy with little people showing their love for the goodies. Above is all you get a happy cloud of smells. Pick from many colors and different styles of t-shirts and instantly it is your one of a kind pick. There is also a full size run for this unisex t-shirt, so you can buy it for the guy or gal in your life. Hurray for the Happy Food Smells T-Shirt. Halloween and Thanksgiving are the time year that pumpkins are everywhere for fun and for food. And if you like math and pie then this give you an opportunity to wear a funny t-shirt. 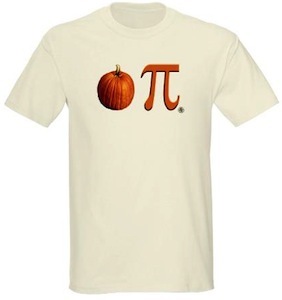 This t-shirt shows a nice picture of a pumpkin and beside it there is the match sign of pi and that makes the t-shirt says “Pumpkin pie”. And you can get this fun pumpkin t-shirt in a range of colors an styles so that you are ready of Thanksgiving dinner.